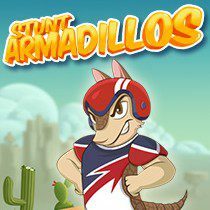 Hit the incoming armadillos to boost them forward and cause destruction while they fly. Hit boxes and collect stars to get maximum points. The destruction is the main entertainment of armadillos. They love to roll over with the huge speed and smash everything on their way. Yet, you will have to gain maximum points to win in this game and you will have to get the help of them all. Play the game and unlock more powerful and unique armadillos to proceed further in the game!